Affair of the Heart has been rescheduled. The event has been rescheduled for Friday, June 22nd. The time and place will remain the same. Thank you. 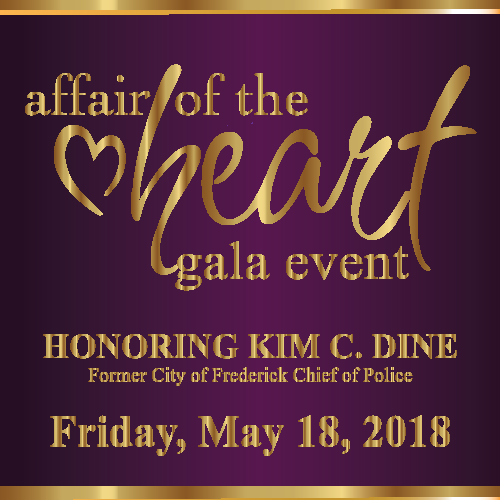 On Friday, May 18th, Heartly House will honor Kim Dine. Kim Dine’s law enforcement career reflects his deep passion to address domestic violence and sexual assault. As Chief of Police, he strengthened the relationship between the Frederick Police Department and Heartly House through innovative programs that remain in place today. This partnership between law enforcement and Heartly House is imperative to combat violence in our community. Limited tickets are available, purchase your tickets today! Interested in sponsoring the event? Please review our sponsorship packet HERE and contact Megan Kula.